Educational Version of GFLOW is free. Professional Version of GFLOW is $495. Click on Order GFLOW for complete price information. GFLOW 2.2.3 is the latest version of GFLOW released on January 24, 2018. Click on GFLOW 2.2.3 Install to download this newest version. Refer to the readme.txt for installation instructions. GFLOW has an integrated context sensitive Help system, but you may download a PDF version by clicking here. GFLOW is a highly efficient stepwise groundwater flow modeling system developed by Haitjema Software, a subdivision of Haitjema Consulting, Inc. GFLOW is a Windows program based on the analytic element method. It models steady state flow in a single heterogeneous aquifer using the Dupuit-Forchheimer assumption. While GFLOW supports some local transient and three-dimensional flow modeling, it is particularly suitable for modeling regional flow. To facilitate detailed local flow modeling, GFLOW supports a MODFLOW-extract option to automatically generate MODFLOW files in a user defined area with aquifer properties and boundary conditions provided by the GFLOW analytic element model. An overview of the most important software features is found in Overview of GFLOW features. What is new in GFLOW? This new release also allows for hybrid GFLOW-MODFLOW models whereby GFLOW represents the intricate surface-groundwater interactions in the upper model layer(s). This is accomplished by representing these upper layer(s) in GFLOW and importing the leakage into these upper layers from the original MODFLOW model. The hybrid model is uniquely suitable to model well-stream interactions that cannot be represented in the original (coarse) MODFLOW model. Details are found in "Hybrid GFLOW-MODFLOW Modeling.pdf." Line-sink strings, inhomogeneity domains and horizontal barriers can now be imported in "xml" format. This facilitates the use of GIS systems to efficiently design GFLOW models. The same analytic elements can also be exported in "xml" format to transfer analytic elements between models. GFLOW is now equiped with a new HTML-based context sensitive Help system that is compatible with newer Windows operating systems. Try out GFLOW for free by downloading the GFLOW install executable. You will be running the "Educational Version" of GFLOW with some features disabled. If you want to purchase the "Professional Version" of GFLOW click on Order GFLOW and provide the requested information and your preferred method of payment. Upon payment, you will be emailed a "user name" and "unlock key" to change the "Educational Version" on your computer into the "Professional Version". Note: Commerical use of the Educational version of GFLOW is strictly prohibited. GFLOW supports conjunctive groundwater - surface water solutions. 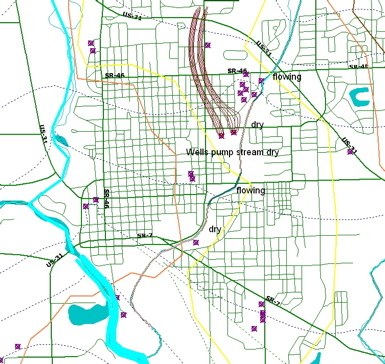 In the image, the pumping rates of several wells near a small stream have been doubled. As a result parts of the stream stopped flowing. See screenshot gallery for additional images of GFLOW models and model operation. Click here to obtain "Analytic Element Modeling of Groundwater Flow"
Owners of "Analytic Element Modeling of Groundwater Flow" click here for software and additional reading.